Christmas, Easter, and weddings all call for the spicy dough. You might already know about Hungarian gingerbread. After all, in 2018, a set of cookie-decorating videos made their way around the internet. In them, a pair of hands busily lays line after line of white icing with the mathematical accuracy of a 3D printer. Incongruously, the baker pipes a vaguely Old World piece of embroidery atop the cookie in mere minutes. The videos, which were many people’s first introduction to the elaborate, painstaking art of Hungarian gingerbread, went viral. Such masterful work, at least to me, seems to exist almost entirely on the internet or in the realm of “cookiers” extraordinaire. But gingerbread artists walk among us. At a Hungarian Christmas fair, I saw traditional gingerbread art by Klara Repas. While Repas is not the baker in these viral videos (that honor goes to decorator Tunde Dugantsi), her creations were equally stunning, and prompted me to ask for a demonstration. A week later, I visit Repas at her sunny New Jersey home, overlooking the Hudson River. (I’m ignoring my coworkers’ jokes, inspired by Hansel and Gretel, about fleeing at the first sight of a human-sized oven.) There’s a tiny gingerbread house on an entryway table, mitten and star cookies along a sideboard, and deep Tupperware bowls filled with undecorated cookies on the counter. Repas herself is soft-spoken and elegant, donning a pair of eyeglasses every time she needs to peer at the fine pattern of her gingerbread, or mézeskalács. Repas pipes an unbroken, smooth line of frosting. While it’s mainly a Christmastime treat in countries such as the U.S., Repas says gingerbread is a year-round affair in Hungary, made by bakers for weddings, Easter, and birthdays. In this respect, her homeland hews to “very old tradition,” she says. Ancient Greeks enjoyed an ancestor of gingerbread, cakes made with honey, and put it in the mouths of the dead for the trip to the afterlife. In many countries, bakers made honey cakes for all kinds of events, such as saint’s days. In the days before icing, the dough was pressed into carved wooden molds, and esteemed bakers had their own proprietary designs. 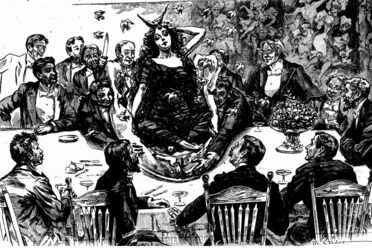 When spices from the east circulated throughout Europe, gingerbread made with ginger, pepper, and other warming spices became a hot commodity for special occasions. Repas’s recipe includes a Hungarian spice mix, of pepper, cardamom, and others. To make it easier to handle, she allows the dough to rest a minimum of eight hours before baking it. Repas can decorate a large cookie in mere minutes. Since Hungary has long been a honey-producing powerhouse, it was a natural place for honey-based gingerbread to take root (though Hungarian mézeskalács don’t typically contain ginger). The Hungarian town of Debrecen, Repas says, “was a center of gingerbread preparation,” and the home of a guild dedicated to baking it. As Repas tells me this, she busily swipes red food coloring over a heart-shaped gingerbread cookie with a paintbrush. Red is a traditional color for Hungarian gingerbread, and can be added in two ways. For a brighter look, decorators brush cookies with a mix of food coloring and egg yolk and set them in the oven to dry. But for a darker sheen, color can be painted on after baking, with hints of the gingerbread shining like gold underneath. One of the reasons gingerbread is not solely associated with Christmas in Hungary is the popularity of these hearts. 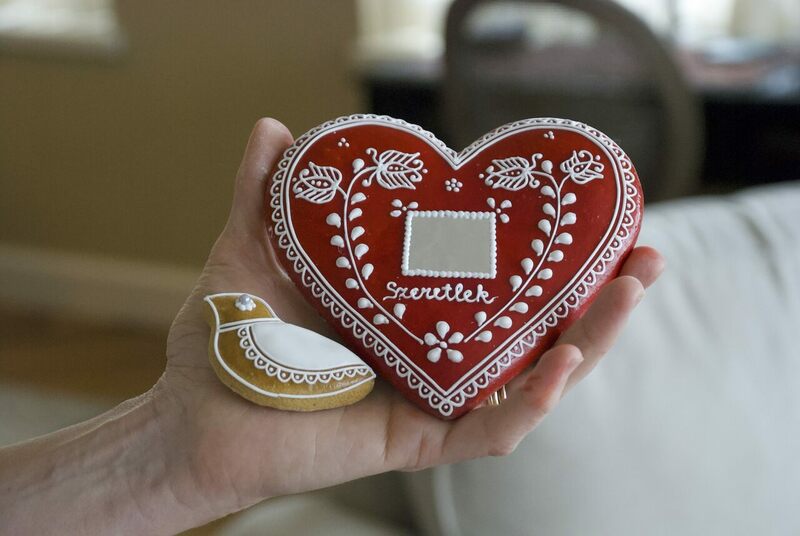 Once traditional gifts from young men for their sweethearts, the hearts often feature small mirrors and the word Szeretlek, a declaration of love. (Similar hearts are popular in Germany and Croatia.) A girl might return the boy’s regard with a gingerbread hussar, or solider. Repas adds a last few leaves onto her design. The Hungarian love for gingerbread has stayed strong year-round. Hungarian Easter also features three-dimensional gingerbread eggs, painted and covered in royal icing. When white icing became common, says Repas, many designs were inspired by the other famous Hungarian folk art, embroidery. Flowers, hearts, and birds are the traditional designs for both embroidery and cookies. Yet despite their ethereal decorations, “Gingerbread is very practical,” Repas says. It stays fresh for a long time, and some varieties can even be kept for years as a decoration. Repas always made gingerbread for her family in Hungary, but it’s not always been her occupation. She was trained as a chemical engineer, and gingerbread and drawing were her two complementary hobbies (though her hands are often too tired from squeezing tubes of icing for drawing). But a few years after moving to Paris for her husband’s job in 2005, she started a business baking and decorating installations for French stores, chocolatiers, and salons de thé. Repas uses small piping bags to decorate her gingerbread. In minutes, I see why fancy French shops wanted Repas’s work in their windows. With small piping bags filled with royal icing, she rapidly outlines the red-painted heart with perfect, unerring accuracy. With impossibly small loops, she covers the edge of the cookie with a lacy border, adding pinprick dots of icing inside each one. Squeezing the piping bag with the thumb and forefinger of her right hand, she delicately keeps it steady with the forefinger of her left hand, moving with surgical accuracy. Repas uses a thicker blend of royal icing for detail work, and a more liquid version for filling in sections and flourishes. Then, she fills in the lacy design on the interior of the cookie. First, she adds a mirror: In this case, a rectangle of aluminum foil set in the center. Setting a mirror into gingerbread, Repas later explains, “is a symbol of sincerity, purity, and [the] reflection of emotions.” Pinprick dabs of icing around the edges of the mirror weld it to the cookie. She frames the mirror with two perfectly symmetrical leafy stems, culminating in tulip flowers: a popular Hungarian cookie and embroidery motif. In her time in India, Repas drew inspiration from local art and design. In 2014, Repas moved from Paris to Mumbai, India, again for her husband’s work. There, she added vibrant greens and oranges—and henna-like patterns of royal icing—to her repertoire, and found herself teaching both children at an orphanage and pastry chefs at five-star hotels. “I was always inspired by other cultures and other designs,” she says, showing me a photo of a cookie emblazoned with the Eiffel Tower, and another with the Taj Mahal. Repas’s home, while not made of gingerbread, is full of gingerbread. As she decorates a large red house cookie and a little white bird, Repas tells me that while the gingerbread guilds of the past are long gone, there’s a Hungarian gingerbread association in Debrecen, led by decorator Judit Szmelo. Szmelo and other folk artists visited New York in early December to demonstrate their work at Manhattan’s Hungarian House. Some of them are professionals; others are hobbyists. Having recently moved to the U.S., Repas, who is waiting for confirmation on a work permit she needs to re-start her gingerbread business, is waiting to see which she’ll be. But in the meanwhile, she’ll keep baking and decorating. If you're going to practice writing cuneiform, why not do it on a cookie? Competitors are baking soul cakes, a bygone Halloween treat. Check out our readers' top gems from the oft-overlooked world of off-brand eats. She baked thousands of pot brownies for AIDS patients. A wine so luxuriously sweet, it's consumed by the spoonful. This Hungarian fried dough can make a rich breakfast or trusty hangover cure. Hungary's favorite chocolate bar is filled with cheese curd.